These past few tacticas I’ve talked quite a bit about the synergies of units and how the Tau army works better as a series of units aiding another rather than in isolation. So its time to start covering just how Tau armies can do that. The best place to start? Well, it’s not called Short Tau Tactica: Pathfinders for nothing! One thing. The unit can do a lot of things and to truly get the best out of them you will have to pick one, because choosing several impedes the units ability to do the others well. When you consider the cost of the unit, compared to others in the list, and just how fragile it is, you will only get a few turns worth of use out of them before they are blown away in a hail of fire from your opponent. That’s because, if they aren’t already considered a deadly unit, they soon will be. They are that good. Use one is to load up on either Ion or Rail rifles (Ion for light infantry and tank killing, Rail for heavy infantry), hunker down in cover and then shoot the hell out of whatever target is needed. If you go for Ion Rifles, its worth perhaps shelling out a pulse accelerator, so as your opponents units get closer, you get an extra turn or two of shooting with a higher weight of firepower from the pulse rifles which are now range 24″. It’s not much, but at the same time, don’t turn your nose up at another 2-14 shots at strength 5 (dependent on unit size). annoys your opponent! Though they can’t be relied upon, taking a unit of 6-8 will produce a decent number of hits a turn, keep them alive long enough to be useful and greatly increase what your units are capable of doing each turn. However you use them, to keep the unit hanging around longer, it’s probably worth spending a few points to buy a Shas’ui (+1Ld and the ability to buy a black sun filter- yes please!) and, if you have the points left over, springing for the bonding knife ritual so they can regroup regardless of size. Now the big conundrum to me is if you should bother taking a Devilfish. Whilst they have their uses, being able to scout means you will probably be able to set the squad up in a good position before the game anyway and each turn they spend in a transport is one less turn they are capable of being useful. The option of taking a Recon Drone seems ok, but for the cost (and the rules being a bit unclear as to if it can stay a part of the Devilfish after the Pathfinders have disembarked), I’m not too sure if it’s a good use for the unit, unless you have a strategy that relies upon a part of your army being able to deep strike or appear on the flanks reliably. 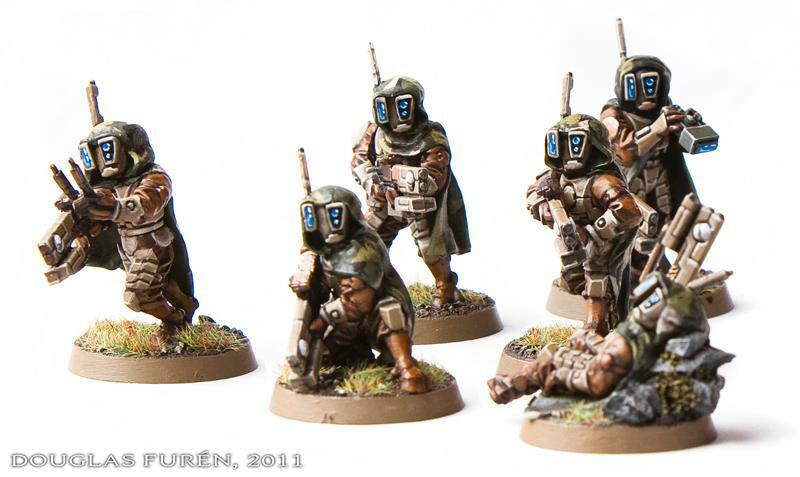 All in all, Pathfinders make a great addition to a Tau force. Though forced to be static in nature, in an army that can be otherwise be flexible and on the move at all times, they make up for it by providing such a valuable commodity synchronicity. Also, no need to take markerlights in other units now either, so those units can focus on killing enemy units or securing objectives. An example of the different approach the Tau Empire take to warfare, Pathfinders will probably make their way into your list at some point. Once used, I’m not sure if they will ever be removed from it. Just a quick question to the community, how are people finding the Farsight supplement? I’ve yet to read it as I like my hardcover books, but has it affected how people play their armies? Or is it another nice addition that doesn’t add too much unless you like a certain type of list, ala the Iyanden supplement? I’m interested to hear peoples opinions on this, so post in the comments section your experiences. Anyway, see you soon for another Short Tau Tactica.